Versatile. Capable. Efficient. The John Deere 1023E compact utility tractor is the perfect solution for anyone in need of a powerful, easy-to-use tractor that can knock out all the odd jobs around the property. The 1023E is uniquely designed to withstand demanding applications, and it’s available now at Virginia Tractor. With six locations in the state, Virginia Tractor is committed to providing the highest-quality and most cost-effective equipment for every job. With a John Deere 1 Series tractor, like the 1023E, your options are virtually endless. It has an unbelievable variety of implements from loaders to mowing decks, so you can jump from task to task on your land without needing to jump from tractor to tractor. Whether you’re loading up sand, pushing boulders or mowing the lawn, your 1023E tractor offers an easily-attachable tool that’s perfect for the job. The 1023E also offers premium features like a deluxe seat and suspension, tilt steering and a deluxe lighting kit, so you can sit back and monitor everything while your tractor does the hard part for you. The 1023E is best suited for tasks like mowing, loading and tillage. The John Deere 1023E compact utility tractor comes equipped with the powerful final-tier-4-compliant diesel engine that is both quiet and efficient. It puts out 22.4 gross horsepower and 16.5 PTO horsepower. Both 4WD and power steering are standard equipment on the 1023E. 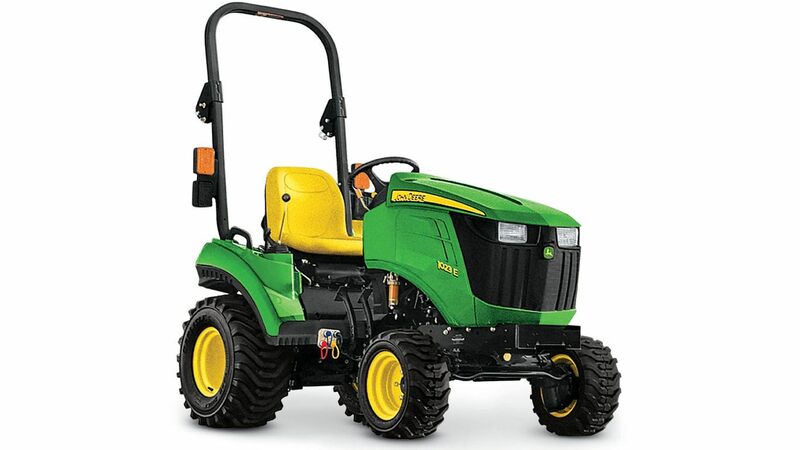 This combination allows for excellent maneuverability and ease of operation of the tractor. The 1023E’s narrow width allows the tractor to work in tight areas where most machines wouldn't dare to go. The 144.8 cm wheelbase and 119.4 cm overall width gives great stability for all type of terrains, so you can worry less and get more done. Implement compounding improves efficiency of the John Deere 1023E by allowing you to mount more than one implement at a time, eliminating implement changeover. Versatile implements include loaders, mower decks, material-collection systems, backhoes, rotary brooms, snow blowers, rotary tillers and more. We’ll highlight a few of our favorites for you below. Loaders. The John Deere 1023E can be equipped with either a D120 front loader or H120 front loader. The H120 has an integrated parking stand that allows the loader to be quickly and easily removed from your 1023E as you sit. You can also quickly remove the bucket and replace with pallet forks for handling different types of material. The D120 is better suited for tractors that will not need to change implements as frequently, but it still provides an easier, tool-less removal. Mower decks. 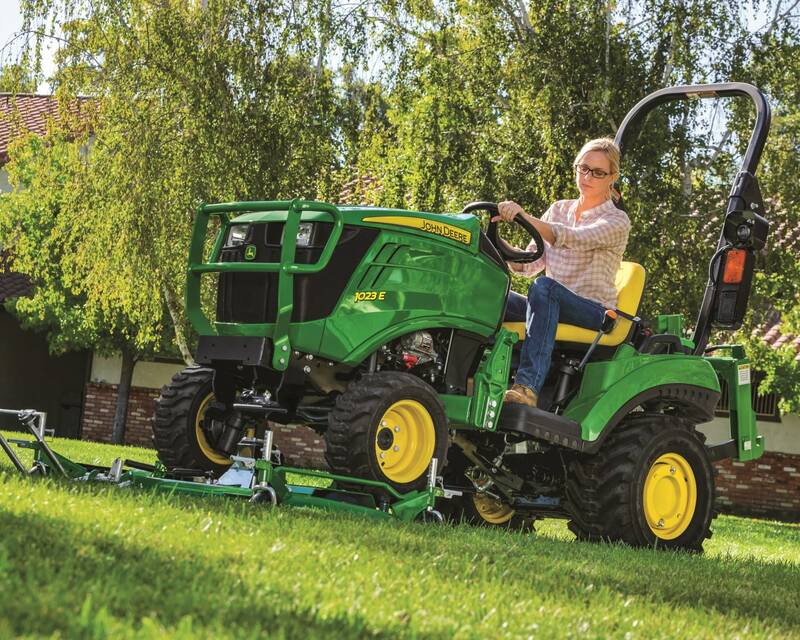 With John Deere AutoConnect, you can attach your mower deck to your 1023E compact utility tractor without even getting out of the seat. As you slowly drive up and over the mower deck, the PTO shaft automatically connects and the latches engage. All you have to do is set the mower cutting height and gauge wheels. Backhoes. Your John Deere 1023E can be equipped with the 260B backhoe, which was designed with maximum operator comfort in mind. Stabilizers, boom and swing locks are accessible from the operator’s seat and have a built-in storage location when the backhoe is in use. All controls are in an ergonomically comfortable position and are easily reachable from within the operator platform when the backhoe is in position. If you want to experience the power and versatility of the John Deere 1023E compact utility tractor for yourself, stop by one of our six Virginia Tractor locations to chat with our experts. If you have questions in the meantime, you can give us a call at (888) 782-8005 or request a quote below.